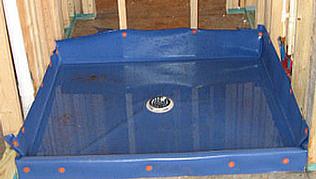 The most important thing you’ll do here is to hire a really good full-service plumbing contractor. Accomplishing that, things ought to go your way. 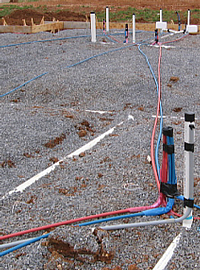 ● Rough-in of water and sewer lines prior to pouring concrete floor (if you are building on a slab foundation, as shown above, or a basement house with a concrete floor). 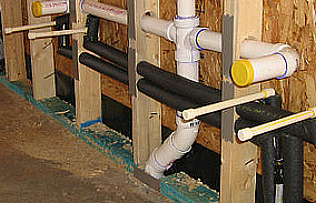 If yours is a crawlspace foundation, the plumber can do his rough-in after the house is framed. ● Dig for and install water and sewer connections to public utility ─ or septic tank if needed. I recommend that plumbing be the first of your rough-ins after framing is complete. ● Provide material for all the above.